Rest assured that the information you provide below is NOT GIVEN TO ANYONE FOR ANY REASON. The information is needed to make sure we can provide you with the information you have requested. The form below is for those couples looking for full service wedding ceremony services at the Wedding Bowl in La Jolla. 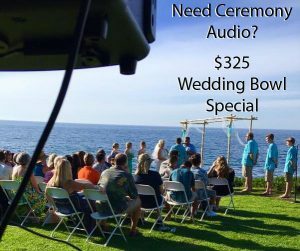 If you’re looking for our Park Audio system, please visit San Diego Ceremony Audio. Only fill out the contact form below for services with Vows From The Heart AFTER securing the park permit for your wedding date! NOTE - In order to receive information from us, you MUST provide us with the following Mailing Address information. NOT AN EMAIL ADDRESS. I need to know where you are in order to send you the right information. Can you please share how you found us?